Welcome to Kavio’s Official Blog. - Basics to Fashion Clothing & Apparel. 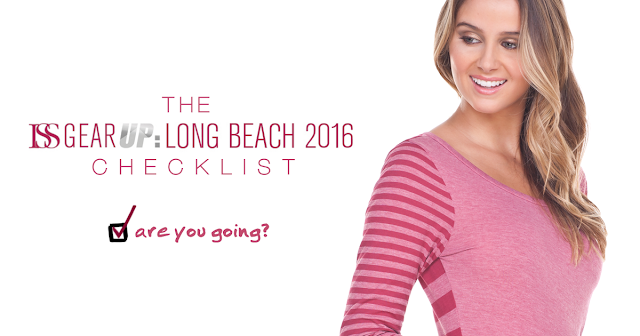 : ISS Long Beach - Are you going? ISS Long Beach - Are you going? The ISS LONG BEACH SHOW is just a little over a week away! The ISS (Imprinted Sportswear Trade Show) has established themselves to be one of the largest and biggest tradeshows ever dedicated solely to the decorated apparel industry. supplies and printing equipment you'll ever need. If you're a veteran, than you already know what to bring! 1) Bring A Note Book - Make a list and note your goals, which vendors do you want to see? Include some of your personal goals and those of the companies "MUST SEE" to visit. Is there any new styles or products you wish to see in person? Do you need to place an order? A notebook comes in handy incase you need to remember something from meeting a vendor? 2) Research - Spend a little time researching your vendors, so that you'll have a clear idea of whom and what you need to see and what you need to learn from them. That way you'll have useful questions to ask on hand, without using up too much time on "small talk". 3) Plan Ahead - Decide how much time you want to spend at the show. Tackle your "must see" and important visits first, as they can be overwhelming and can take up much of your time. That way if your day is cut short you won't miss the vital exhibits. 4) Make an Appointment - Consider making an appointment with those exhibitors you really want to meet with. Maybe you haven't seen everything in person and need to place a sample order. Tradeshows exhibitors are packed with lots of information and usually bring all their products with them. 5) Teamwork - If co-workers are attending the show with you, maybe split up the work? Divide the show up into sections. Each team member can sit in different seminars that they specialize in, to maximize the amount of information gathered by the entire team. 6) Handouts - Most exhibitors will carry new information because it is the beginning of the year. But if everything is still the same, don't grab it. You will be gathering more weight in your tote bag way before by the time it hits 5PM. Collect the information that is of interest/important or new for you, or that could be of value for others in your company. Remember: It's Teamwork. Many exhibitors will gladly mail literature, catalogs, and useful information which relieve you from having to carry so much around the exhibit halls. 7) Business Cards - Quite a hassle, small little paper things they are, but its important to have. When networking with your vendors, make sure you have enough business cards. Trust us, you will find yourself immersed in speaking to many vendors and helpful individuals. *So make sure you bring enough! Especially if you placed an order at the show, needed some information mailed or have an important question that needs to be followed up!! 8) Box Tote on Wheels - All those handouts can be overwhelming! A tradeshow filled with over hundreds of vendors, everyone is DYING to give you a handout. (NOT, just kidding) But yes, these handouts can be mutually important! You will find yourself very interested in many companies and the products they offer, but bringing a tote BAG will not be enough! And plus, it would be too heavy to carry around. These are probably the most useful tips and tricks you could use, especially if you're attending a tradeshow for more than one day. Don't forget to take a moment after the show to sit and relax! It makes a great time for you to jot down and reflect on a few things on vendors, ideas and products that come into mind! Especially something that you thought was effective and can be of use. A long travel or long hours at a tradeshow can joggle anyone's memory. Also, be sure to follow-up with new contacts and vendors after the show. Oh and also... Don't forget! REMEMBER TO STOP BY AND SAY HI TO US! DID WE MISS ANYTHING? Feel free to comment and message us!